As technology is serving its best at every other industry and aspect of lives, it has crossed all the boundaries and assist a lot in bringing up mesmerizing developments in the field of Computer Science & Information Technology. When we go deeper into the research, we can see most mind-blowing and captivating work that the domain specialist has done in this area. Excluding the big and vast creations like the inventions in the sector of Artificial Intelligence, and if we only have a close look at smaller divisions where science has functioned best, such as the logo designing field or video animation field, we would be able to point countless hypnotizing features. Even among both of these two categories, most of the enchanting work has been done in the video animation industry. That’s true, video animation is no more just a small part of IT, but it has become one of the world’s leading industry to augment the human experience in countless ways. It has been proved beneficial in every industry for thousands of reasons, but above all the ultimate benefit that it has provided up till yet is that it has assisted large corporations and brands to increase their revenue. The use of the video animation was started from the media and entertainment industry, and today it has its roots set firmly in almost every other industry like education, business, architecture & engineering, manufacturing, simulations, scientific visualizations, gaming, medical industry, and hundred others. Since the animated videos are used widely in so many places, it was not possible to use only one type of animation everywhere, which is why industry experts came up with diverse kinds of animations following the basics of 2D and 3D animation to utilize animation suitably. All these types of animation are assigned for different purpose according to the needs and situation in which they are needed. These captivating variety of the video animations are discussed below to give everyone a proper idea what is their working and where they are used. When the 3D video animation was familiarized to the world, the demands of 2D animated videos were somewhat suppressed, and it was assumed that in the coming days 2D animations were removed entirely from the platform of video animation. In order to save the sinking ship, industry experts come up with a technique to use the blended form of 2D and 3D animation, where all the objects and characters were created in 2D format whereas the entire scene will give the look of the 3D environment. Whiteboard video animation has been considered as the easiest and entertaining form of the animation that is used to deliver complex details or information into the simpler and straightforward way. Although the animation is plain and comprises almost no colors, but it somehow manages to be one of the very popular types of animation. Kinetic typography is constructed using the different font styles and sizes and assigning some movements to them in a specific pattern to show animation. They are designed in such a way to exhibit a kinetic typography illusion that helps to grasp the audience attention easily. It is used by the organizations or website owners to divert user’s attention towards some important message or note. With the help of various font styles and sizes, it gets so easy to grab the user’s consideration easily. Explainer videos are created using either 2D format or 3D techniques. 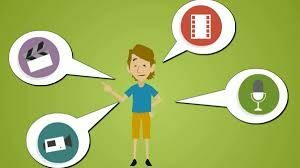 The use of the explainer video animation is more in the business and education sector, where people need to explain different concepts, strategies, statistics, and similar things to the audience, clients, or any stakeholders. The use of motion graphics can be spotted easily on the websites. It is a very unique type of video animation that has a static or still backgrounds whereas the objects or characters in the video performs activities. There are so many trends that motion graphics follow to provide the excellent user experience. Previous PostPrevious Finding the Balance between cheap and expensive web design agencies!